Q1. What are the security concerns here? Q2. Even after 'obsolete cipher suit' message, Chrome is able to establish private connection and I see a GREEN lock, how it's doing that? I see another question here on Sec.SE which talks about 'Obsolete Cryptography', but I have different set of issues. Note: example.com is just an example not a real host. 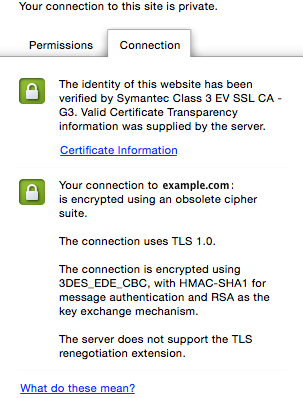 TLS 1.0 is not quite perfect. See the answers to this question for details. 3DES is somewhat odd these days, but still okay, nonetheless depricated by AES. using RSA as a key exchange mechanism fails to provide forward secrecy. using SHA1 is okayish right now but expecected to be broken any time, hence there is the SHA2 family available for quite some time already. Well, the developers of Chrome chose to accept this and show a green lock instead of a yellow one (connection established with warnings) for now, as otherwise a lot of sites (banks for example) would fail to show the green lock. While using that exact combination is not ideal, it's still able to establish a connection, verify the remote machine and the exchanged data is reasonably safe (for now, at least, see forward secrecy link above). As to how this is established: there is a handshake taking place between the browser and the server, agreeing on a specific cipher suite. Your browser and that server agreed on this one (because either might not support anything newer), even if it's not the best option. See the How does TLS work for good coverage on that. Your connection is in fact, encrypted, and as such, should be safer than no encryption at all. Someone sniffing your network, or watching your traffic, should in theory only see encrypted data. That said, the implementation of encryption that is used for this particular connection is outdated, and could have weaknesses. Why is this happening? I'm not sure. Perhaps because either the server you are connecting to, or your browser, only supports TLS 1.0. This is a little interesting in itself, if the domain name is correct (example.com). When I go to https://example.com myself, I can see it using TLS 1.2 in my browser. It could in theory be the result of some kind of attack, which forces your browser to use an older encryption standard, so as to be able to exploit vulnerabilities that have been fixed in newer standards, but I would be very careful about jumping to conclusions (assuming you are more or less an average user, and not a particularly interesting target for any reason). In any case, reverting to TLS 1.0 could in theory open you up to various attacks. So how can you secure yourself against this? The easiest way is probably to simply disable older versions of TLS in your browser. Not the answer you're looking for? Browse other questions tagged tls chrome or ask your own question. Is TLS 1.0 more secure than TLS 1.2?